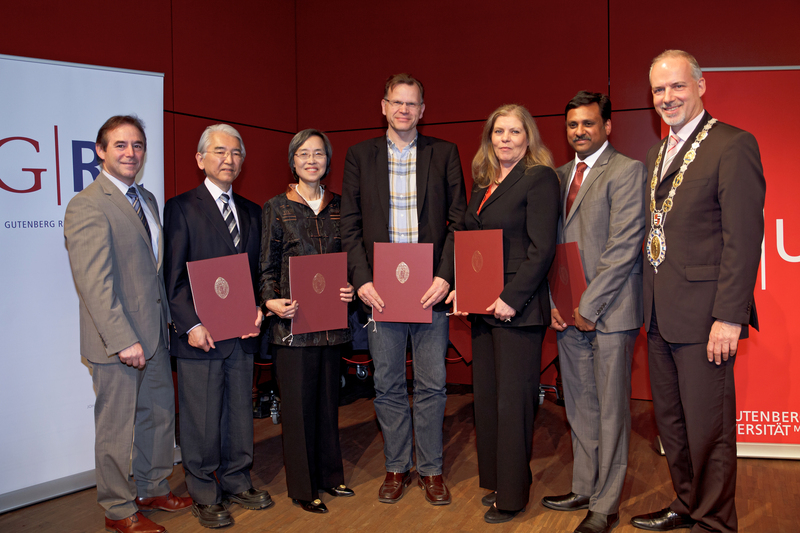 It is the highlight of the year for the Gutenberg Research College (GRC): the evening ceremony held to induct the new GRC fellows and to bestow the annual Gutenberg Research Award to internationally renowned researchers. Johannes Gutenberg University Mainz (JGU) uses this occasion to put a spotlight on the outstanding performance of researchers and the successes they have enjoyed. "Since it was established in 2007, the Gutenberg Research College has been entrusted with nurturing individual excellence and thereby reinforcing existing and pre-eminent academic areas while also helping to launch new and promising fields of research," said Professor Matthias Neubert, Director of the GRC and head of the Theoretical High Energy Physics Group at Mainz University. "Thus we are very pleased today to greet the new GRC fellows and to bestow the 2015 Gutenberg Research Award to two outstanding international researchers." The prize, endowed with EUR 10,000 each, was awarded to the Japanese polymer chemist Professor Kazunori Kataoka and the theologian Professor Kwok Pui Lan, who teaches in the USA. Johannes Gutenberg University Mainz founded the Gutenberg Research College in 2007 with the aim of promoting the university's core academic strengths and supporting promising new fields of research. Individual researchers can also receive support in the form of fellowships. This year, the GRC welcomed three new fellows. Molecular biologist Professor Krishnaraj Rajalingam is conducting research at the Institute of Immunology at the Mainz University Medical Center to better understand molecular signaling, which controls cell processes like pre-programmed cell death, cell migration, or cell differentiation. The work also encompasses investigating the mechanisms underlying the faulty regulation of cell signal paths. Research results should help pave the way for the development of new treatments for autoimmune diseases, neurological conditions, and cancer. In July 2014, Rajalingam received a prestigious Heisenberg Professorship for Cellular Biology, funded by the German Research Foundation. Neurophysiologist Professor Jochen Roper works at the University Medical Center of Goethe University Frankfurt am Main and is a member of the Rhine-Main Neuroscience Network (rmn²). His pioneering research into dopaminergic neurons in the central cortex helped to improve the understanding of neurological and neuropsychiatric disorders. He will continue his research with his colleagues in Mainz and Frankfurt to find out more about important brain functions. Cornelia Schweppe, Professor of Social Pedagogy at Mainz University, established the pioneering research field of transnational social support at JGU's Institute of Education. The research of the internationally renowned social pedagogue covers topics ranging from transnational support, migration, aging, and poverty to the professionalization of social work. As a GRC fellow, Schweppe will research cross-border support processes for elderly people in an age of demographic change. The Gutenberg Research Award 2015 was conferred on two outstanding researchers. Professor Kazunori Kataoka from Tokyo University in Japan is among the most renowned polymer chemists in the world. In particular, he has gained international acclaim for his work with polymeric micelles to help transport medication in tumor therapy. Professor Kwok Pui Lan, theologian at Episcopal Divinity School in Cambridge, Massachusetts, is one of the leading representatives of post-colonial feminist theology, within which she actively advocates the revitalization of Christianity and the promotion of inter-religious dialogue.